Registration for the Live freeroll on board LW will be done at 11am on 18th Dec.
Players will need to give us their Dafa Poker nickname when registering. So please follow the click through and get your account registered before u board. hi newmay. give the NCTours hotline a call and see if they can help? It's a long shot but no harm in trying. good luck! The LWPS will be taking place this weekend on the 18th and 19th Dec. There will be a total of 4 events this time round. One of which is a 1000 USD freeroll which will take place on Saturday at 12 noon. Our main event will commence at 2pm, followed by the re-buy event at 8pm. On sunday we have an all new Christmas Bounty event which starts at 1pm sharp. Note: If u wish to participate in the freeroll, you must have a Dafa Poker account pre-registered before and board the ship. You will need to give us your Dafa Poker nickname when u register on board. We expect a decent turnout over this festive period, as early registration signs look promising for a capacity crowd. So dont hesitate, grab your friends and book your cabin by calling the hotline. For those for you who have not qualified for the main event, you may wish to do so on Dafa Poker. We are giving away $15 in free credits when u do a sign up through our forum, takes 24hrs to be credited. Our last online satellite takes place on Dafa Poker, 9pm thursday and we need a min of 10 players to start. See you onboard this weekend boys. hey all, i am not going to be there due to the dreaded exams.. good luck to all who are going and hope to catch you guys there the next time round!! could you drop your private details to me in a PM, and i'll give them a call to see if anything can be worked out. Unfortunately its still going to be a bit of a long shot. last chance to qualify for LWPS IV via satellite this evening. register now for $10 + $1 to win your seat to the LWPS IV Main event! I'm a newbie here. What are the chances for slot availablility for the main event if I decide to do a walk-in registration on Dec 18? 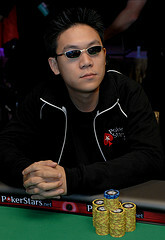 I've joined this Forum and Dafa Poker.